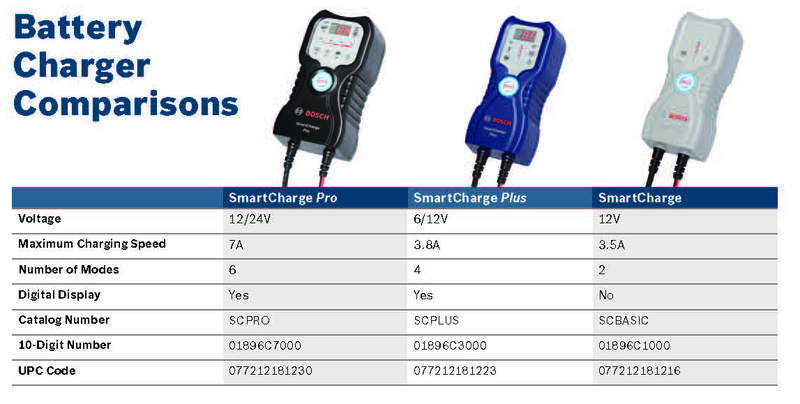 Tools Battery Chargers | Diamond Diesel & Turbo Service, Inc.
Bosch SmartCharge Battery Chargers/Maintainers are high-quality, ergonomically-shaped chargers, designed with advanced safety and smart features and come equipped with a full accessory package. The accessory package includes fully-insulated and removable clamps, quick-connect harness with mounting rings, cable fuse for safety and protection, mounting hooks, and an SAE adapter for enhanced compatibility. State-of-the-art technology and self-monitoring functions ensure that new Bosch SmartCharge Battery Chargers/Maintainers promote long battery life while delivering spark protection, overheating protection, reverse polarity protection and overcharging protection. The devices will automatically switch between trickle and pulse modes, adjusting the charging algorithm according to the state of the battery. The new digital display, available on the SmartCharge Plus and SmartCharge Pro, allows users to see the status of the charge in real time and receive safety alerts. The new Bosch SmartCharge line covers applications including passenger vehicles, classic cars, motorcycles, boats, ATVs, snowmobiles and delivery vehicles. The SmartCharge Pro is also compatible with heavy-duty trucks. With three different models to choose from, Bosch SmartCharge Battery Chargers suit the needs of the professional technician as well as the DIYer.